Over the past week or so, I have noticed it. Slowly at first, one or two men I see sporting beards. Then as the weather has gotten colder and the leaves have taken on more vibrant colors, more and more whiskers are showing up. Yesterday I was out in “the big city” (Rutland for the rest of the world) and noticed it, more men than not are sporting beards. What does this mean? Who cares? From my personal observations, there is a direct correlation between the upcoming hunting season, and men with beards. Why? I have no idea, better camouflage? Facial hair makes the deer think that these hunters are fellow animals? Men are spending more time out in the woods “with the guys” and their women aren’t around to bug them about shaving? It’s warmer? I don’t know the actual reason if there really is one, but I do know that men with beards are much more prevalent during hunting season than any other time and since deer hunting is practically around the corner (okay, if you are hunting with bow and arrow, it is around the corner – October 3rd), men around these parts are much hairier. In searching around to see if my observations are merely some figment of my own imagination, I found this on the phenomenon of men and beards during hunting season on the website www.deerbeards.com (yes there is seriously such a site and this came directly from them who I dare say must be authorities on the subject given their blog name) Thanks guys for clarifying this for me! I appreciate the information. Outdoor enthusiasts are familiar with the phrase “Hunting Beard”, but much like telling camp stories of Sasquatch, no one knows when the tradition started. Through out history, hunters and mountain men have always grown and maintained flowing manes of facial hair. Fundamentally, the purpose of a hunting beard was to provide warmth and protection for the hunter. Today, a beard directly connects the hunter to their primal roots. The evolutionary history of bearded hunting clans can be traced back for some 4 million years, as one of the oldest of all surviving mammal groups. Most paleontologists consider that these “clans” share a common ancestor with early primates and probably lived during the late Cretaceous together with the last dinosaurs. It was during this time that the oldest known Big Game Hunting Clans flourished in North America, but they were also widespread in Eurasia and Africa. 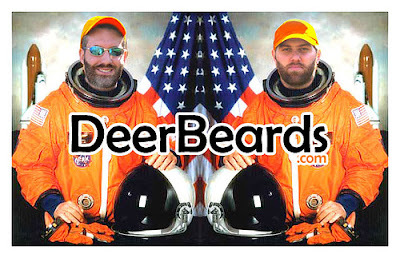 “Deer Beards” are special for these are the beards grown by otherwise cleanly shaved men, solely for the hunting season. Unlike our bearded ancestors, modern day hunters spend far less time engaged in their favorite past-time. Scientists blame Mans transformation from “Hunter/Gatherer” to “Sitter/Sleeper” on a steady food supply, but some experts blame the invention of the “Drive Thru window”, cable and the term “WIFE”. Today, the typical hunter gathers only once a year to relive the glory of eons past. Today, we had roasted chicken soup for dinner. Being a cold and rainy day, and most of the T’s having colds, soup seemed like the answer to “what’s for dinner?” What goes good with soup? Bread, of course! I stumbled across a recipe for Speedy No-Knead bread from the NY Times and decided that it sounded interesting. While I am very anxious to make one of those overnight, sitting, fermenting breads that look so darn awesome, I must admit that I am one desiring instant (okay, we’re dealing with bread here and nothing with yeast is really instant) satisfaction. Seeing how this bread could be made in under six hours and I had a soccer game in Manchester to attend at 4 p.m. this sounded like a good alternative. Here are some pictures of the process and the finished product which I highly recommend. Light, fluffy, good crust and tasty. I dug this one out of the garden this afternoon, while digging carrots for soup. I thought that the two had grow together and fused, but was pleasantly surprised to find that they are two separate carrots, puzzle pieces if you will, fitting together nicely. Good job, Mother Nature! Tim is taking it to school tomorrow to share at TA. Yaz, a birth control pill manufactured by Bayer (the aspirin people) has been all over the news and blog world in the past few days. It appears that Bayer has caught a great deal of bad press due to the fact that approximately 70 lawsuits have been filed against the manufacturer alleging injuries resulting from consuming the pill and its sister pill, Yasmin. Litigants report that the birth control pills containing the novel progestin, drospirenone (which was approved by the FDA in 2001 in Yasmin), cause increased risk of strokes, blood clots and heart problems. In fact on Friday, the news was replete with a Swiss investigation of the death of an otherwise healthy young woman earlier this month from a pulmonary embolism after beginning the use of Yaz ten months earlier and the death of a 16-year-old girl after she began taking Yaz earlier this year. Pulmonary embolisms are scary stuff since they are usually fatal and strike with little or no, warning. The New York Times published an article on Friday outlining one woman’s illness following ingesting Yaz as well as a recount of the difficulties Bayer has encountered both early on and more recently as a result of its’ top selling products. There is also evidence that the use of Yaz can cause devastating gall bladder disease requiring surgical removal of the gallbladder according to Dr. Shezad Malik. Early on, both Yaz and Yasmin were advertised as drugs to not only provide contraceptive relief, but also to provide acne treatment and treatment for pre-menstrual syndrome and other pre-menstrual mood and emotional issues suffered by many women. Bayer was admonished by the FDA and agreed to launch a new advertising campaign downplaying its earlier advertising and warning women of the risks inherent in the use of any birth control pill. Bayer has endured the wrath of the FDA recently also when it was issued a warning letter regarding quality control issues at the German manufacturing plant where drospirenone is produced for the birth control line. This called into question in some fronts the effectiveness of the birth control pills that were manufactured with this product. The FDA and Bayer both advised that there was no need to recall the drugs and their effectiveness as a contraceptive should not be affected by the quality issues addressed by the FDA. Today, my friend Tracy Station, who writes for FiercePharma devoted her article to the Yaz and Yasmin controversy and gives the reader a good overview of both sides of the controversy. The buzz in legal circles is whether the FDA will cause Bayer to recall Yaz given the frenzy of claims and allegations. There are presently cases filed in federal courts in Georgia, Pennsylvania, Ohio, Puerto Rico and Wisconsin alleging product liability claims against Bayer for alleged Yaz and Yasmin related injuries. The United States Judicial Panel on Multidistrict litigation scheduled a hearing on the consolidation of all Yaz litigation into one forum under the auspices of one federal judge on September 24th. No decision has been released as of yet regarding the outcome of that hearing. This is in addition to any state court claims, such as the Illinois case, which has been filed. My interest in this is both intellectual and personal. I have taken Yaz since September 2006. Earlier this year, I went online scouring forums and blogs for information about Yaz and a possible link to rashes or contact dermatitis. At the time, I was suffering from a horrendous rash on various parts of my body that lasted well over a year and corresponded from a time perspective to my switch to Yaz. I was amazed to read the horror stories conveyed by hundreds of women (and some men on their women’s behalf) relating to health issues and problems which seemed to surface after commencing a Yaz or Yasmin regime. I discounted a large amount since some of the posters seemed to have a penchant for complaining. I found nothing on “official” medical sites regarding a link between the two on my issue despite spending a great deal of time looking for one. My concern stemmed solely from the coincidence of the appearance of a rash that was stubborn and did not subside despite removal of multiple possible allergens from both my environment and my diet and my switch-over to Yaz. I must admit that the news these last few days is alarming and rest assured that I will be monitoring what goes on and make an informed decision after discussing the whole issue with my doctor if the investigations that are underway in Switzerland reveals a definite link between the ingestion of Yaz and the embolism which killed a 16-year-old girl early this year and killed another woman earlier this month. The weather matched our spirits around here today. Cold and rainy. The day started off with a trip to the hospital for an MRI for our oldest son to help diagnose a strange lump on his rib. After some confusion about the orders faxed from the doctor, my husband was able to retrieve them and the test proceeded…until the TJ broke the MRI machine. Or at least that’s what my husband told him when they informed us that they wouldn’t be able to do all the images requested since the machine completely died out on them. TJ was somewhat happy because after 20 minutes of laying with his arms above his head and tucked in, both his arms had fallen way asleep. We also lost one of the chickens today. Last night, one hen never made it in the henhouse and we believe that she was suffering from egg impaction. This morning or rather this afternoon, Tom found her. A proper burial ensued. To color all of this, we have these colds that are running amuck throughout the family and one of us is more cranky than the other depending upon the hour and the day. Tonight I ordered the middle one to bed (do not pass go, do not collect $200) after catechism class because he is so cranky, he has to be getting sick… again. He came home from a campout this weekend with scouts, complaining of a headache, lack of sleep and overall being miserable and bursting into tears at the drop of a hat. No fun for Mom or Dad when that happens. Here’s some pictures I took playing around with my birthday present, a Panasonic Lumix digital camera. I’m loving it, now that I’ve actually had some time to play around with it. This picture of the goats was shot leaning against my truck in the driveway for those of you familiar with our house, testing the digital zoom on the camera. So…..after the boys composed themselves and got up from rolling hysterically on the floor, they let me open the smaller wrapped present that was in the bottom of the box. A bright red, shiny new digital camera. I had to wrestle it free of Tyler’s hands in order to actually get to hold for this picture. (Note his scowl). Seems he likes it too, maybe more than me, if that is even possible. So you see, being a mom of three sons isn’t without its humor. And the lesson in all of this is – sometimes if you look beyond the stinky sock in life, there is a real gift in there somewhere. I am an Army of One. At least for the next few days. I am on my own, manning the controls, running the ship, holding down the fort. I will be answering to no one, ruling with reckless abandon! I am woman, hear me roar! – Okay, that said, what I don’t know how to do over the next few days is to be in three different places at once juggling orthodontic appointments, soccer practice and games, but as soon as I figure that out, you all better watch out because I will be unstoppable. Until then, I will be like the Little Engine that Could. Chug, chug, chugging up that hill. The New York Times has an article regarding the use of adjuvants in the flu vaccine. Adjuvants are additives which boost the effectiveness of a vaccine, consequently permitting the vaccine to be stretched as it were, like thinly slicing the roast to feed more people. Since more commonly now, only proteins or protein fragments are used in vaccines, where previously a weakened or dead pathogen was administered. The difference has resulted in the use of adjuvants to enhance the effectiveness of the vaccine. Alum is commonly used in tetanus and hepatitis vaccines to boost the vaccine’s effectiveness and is generally considered a weak adjuvant and safe for use. Alum is not effective in the flu vaccine. Other adjuvants used in the past include: gram-negative bacteria, cholesterol, fatty acids, paraffins and vegetable oils. Adjuvants are foreign bodies and produce an adverse reaction in the body. The purpose of the adjuvant is to produce a reaction in the body. The type of reaction it produces however cannot be guaranteed and therein lies the conundrum. It can be as simple as pain at the injection site, fatigue and swelling. There is also argument that it can trigger more substantial responses, such as autoimmune disease such as rheumatoid arthritis. The debate, explained in the article is whether or not adjuvants should be used. The United States, at least for now, is not permitting the use of adjuvants in its vaccine for the flu. My favorite time of the year arrives today officially at 5:18 p.m. with the autumnal equinox. “Equinox” refers to the fact that the sun is directly over the equator, rendering the length of night and day across the earth to equal amounts. This occurs two times a year – spring and autumn. The other two important moments are the solstices – summer and winter – representing the longest and shortest days of the year, respectively. Essentially today, regardless of where you are in the world, the length of day and night are equal. It is the beginning of the astrological sign Libra – the scales, which represents a balance (my astrological sign so no wonder I have a partiality to this season). Autumnal equinox is commonly referred to around the world as a time of balance, equality and harmony in world. Pagan rituals adapted around the autumnal equinox revolve around the harvest and respecting and appreciating the bounties provided by Mother Earth. Autumnal equinox is commonly called the first day of Fall here in the United States, but it is also known by the following: Cornucopia, The Feast of Avilon, Festival of Dionysus, Harvest Home, Harvest Tide, Mabon, Night of the Hunter, Second Harvest Festival, Wine Harvest and Witch’s Thanksgiving. Traditionally, the full moon closest to the Autumnal Equinox is called the Harvest Moon because it was so bright that the farmers could harvest crops by the light of the moon. It is also called the Wine Moon or Wine Harvest since most wine grapes are harvested during the lunar period beginning in September. Or, more appropriately, does anyone have a clue as to what this might be? Here’s the view of the outside, which Tom was convinced was a watermelon.